The WE Chicago Chapter of Women in ETFs launched in September of 2014, making it the second US chapter to launch. As of August 2018, WE Chicago proudly has over 300 members, both men & women, spanning the ETF Ecosystem: ETF providers, ETF asset managers, ETF owners, media, index providers, broker-dealers, law firms, new ETF entrants. Click on the links below to navigate to other areas of the WE Chicago Chapter page. One of the largest regional WE chapters with a fast growing constituency, WE Chicago offers many opportunities for sponsors to gain recognition - internally and externally - as a leader in supporting women in financial services. The Chicago Chapter of Women in ETFs is pleased to host our third annual Mentorship Dinner at Wildfire Chicago. WE members are invited to join in an intimate setting to engage in a conversation with successful leaders across our industry. The ETF industry is evolving rapidly, requiring professionals and firms to stay current on timely business trends. Please join the Chicago Chapter of WE for a three-part discussion with industry experts focused on the evolution in ETF providers' business models, in ETF product development, and in the individual skill set and knowledge requirements necessary to stay competitive. The Chicago Chapter of Women in ETFs (WE) is celebrating its fourth anniversary and we’d love to celebrate with you! Please join us on Monday June 11, 2018 at PORTER Kitchen & Deck for snacks and cocktails while enjoying amazing views of the Chicago River and skyline. Our annual anniversary event provides attendee’s the opportunity to catch up with friends in the ETF industry, network with colleagues, and celebrate a special milestone together with members of WE. Space is limited therefore pre-registration is required to attend. 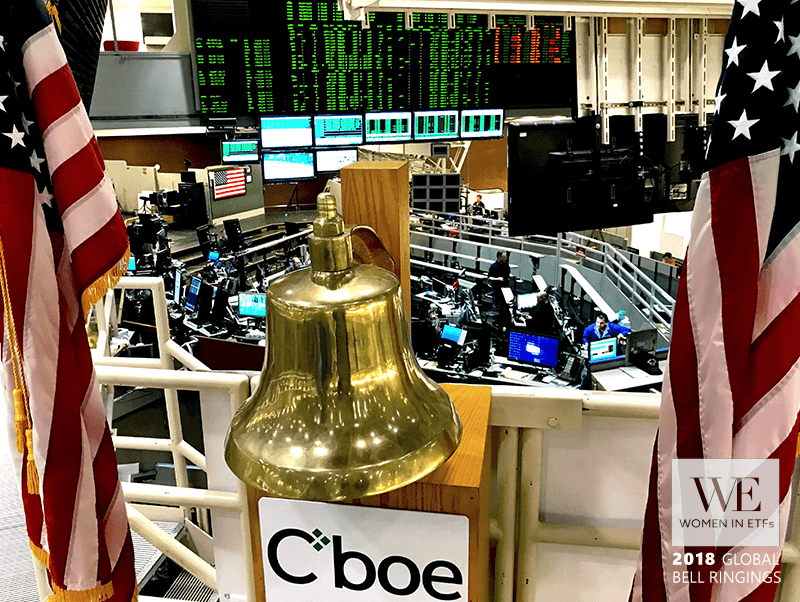 On March 13th of this year, the Chicago WE Chapter, in partnership with the Cboe Options Exchange, celebrated International Women’s Day by hosting our “Ring the Bell for Gender Equality” event. The event brought a group of 75 women and men together to discuss actionable ideas for Gender Equality. Some of the key takeaways from the panelists from Morningstar, Goldman Sachs Asset Management, MSCI, and Northern Trust Asset Management included knowing your worth, finding a career advocate (vs. mentor), and actionable ideas for supporting women in the workplace. The generous sponsorship from Cboe provided attendees the opportunity to network after the panel discussion.